USDA has been working closely with farmers and ranchers to make critical investments in renewable fuels, from manufacturing facilities to storage tanks and dispensing pumps, and bio-based products, including research breakthroughs and enhanced product visibility. 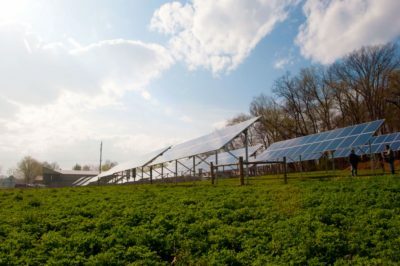 Even in rural businesses or on the farm, USDA has supported significant deployments of solar and wind power systems, anaerobic digesters, and energy efficiency solutions. These USDA investments have created remarkable momentum in rural economic growth. Read more. 1000-kilowatt solar array to power their farm, a neighboring farm and homes on the local electrical grid. Flickr image. This entry was posted in Nebraska / Midwest News, NewsBlog and tagged 40 Nebraska REAP grant awardees, Central City's Community Solar Garden, Nebraskans for Solar, Secretary of Agriculture Tom Vilsack, solar energy workshops in Nebraska, sustainable energy for America, U.S. Department of Agriculture (USDA), USDA Medium on November 2, 2016 by Helen Deffenbacher. You are cordially invited to join our new NFS Learning Group, which we will launch at our December 11th workshop and continue to sponsor the second Thursday of each month, 7 to 8:30 p.m., unless otherwise announced. Everyone who attends our November 13th workshop will have the opportunity to sign up for the Learning Group, volunteer to help create a plan for 2015, order a free copy of the 2015 Solar Electricity Handbook, and write down your suggestions for fun and educational projects and events, for example: recommended book titles and other resources to post on our website, field trips (including opportunities to watch solar installations, visit a farm that’s off the grid, and a backyard, solar-powered greenhouse), plus step-by-step instructions for do-it-yourself solar projects, with one or more workshops and projects geared toward young people. Please plan to attend our November 13th workshop (see our calendar for details) and bring your ideas for fun and educational group projects and activities! Free Bestselling Book on Solar! Thirty-five early-release copies of the 2015 edition of the bestseller, Solar Electricity Handbook, by Michael Boxwell, have been donated to Nebraskans for Solar. The books will be distributed at our December 11th workshop. Additional copies can be purchased at the discounted price of $12 each. December Workshop – Plus More to Come in 2015! Our December 11th workshop presenter will be Jared Friesen, Renewable Energy Specialist and Electrical Project Manager with Morrissey Engineering Inc. He will discuss “The Economics of Generating Your Own Solar Electricity” and facilitate a Q&A on solar energy. (Further details will be announced at our November 13th workshop). Jared is a licensed Professional Engineer with a bachelor’s degree in electrical engineering from the University of Nebraska at Lincoln (UNL). He is a Leadership in Energy and Environmental Design (LEED) accredited professional and has received advanced training through Solar Energy International’s industry-recognized training program. In 2010 he was instrumental in bringing solar energy to Morrissey Engineering’s LEED Platinum certified office building at 4940 North 118th Street. A major expansion of that system was made in 2014, resulting in its current production of 20-25% of the building’s total energy needs. Morrissey Engineering was the first building in Nebraska to be awarded the U.S. Green Building Council’s Leadership in Energy and Environmental Design (LEED) Platinum certification, the highest certification level achievable. Click here to watch a video presentation. View the 4940 Building’s Live Solar Output here. At our December 11th workshop, Nebraskans for Solar will also hand out a list of your suggestions for events and projects from our November 13th workshop and schedule a meeting for volunteers to help create a Learning Group Plan for 2015. This entry was posted in NewsBlog and tagged costs of photovoltaic (PV) in Nebraska, Jared Friesen, Morrissey Engineering Inc (MEI), Nebraska's first LEED Platinum Building, Nebraskans for Solar, NFS Learning Group, Solar Electricity Handbook 2015 Edition, solar energy workshops in Nebraska on November 10, 2014 by Helen Deffenbacher.